In a cruel twist of fate, the first two New 3DS consoles I ordered were both damaged - the first had a large imprint down the left side of the upper screen, and the second had a missing screw on it's back plate. It's astonishing how I could have such atrocious luck, but when the third replacement arrived and finally worked with no major problems, my true insight to the system could begin. The New 3DS has several upgrades. The most important one is the improved CPU, which makes this system substantially more powerful than the original console. As a result, some large scale games like the upcoming Xenoblade Chronicles 3D will only be available for New 3DS systems. The console itself has also been slightly restructured; the game card slot is now on the bottom left beside the headphone port and stylus pen. The volume slider is on the left side of the upper screen, parallel with the 3D depth slider which remains on the the right side of the screen. The select and start buttons are below the ABXY buttons, which have been recoloured in a way that resembles the classic SNES controller. We also have the addition of ZL and ZR secondary shoulder buttons, sitting next to the original L and R ones. The only real issue I have with this new layout is the fact that the power button is now on the front right of the console. It's a little awkward, providing no feedback when pressed and being hard to firmly push down. This aside, the new control setup works perfectly. The most notable feature on the New 3DS is of course the second analogue nub, dubbed a C Stick. This is essentially a pointing stick that is found on many laptop keyboards, used to the control the mouse cursor. It works by sensing the direction of any applied force; this means it does not move like the circle pad, which may take some getting used to. Essentially, you move your thumb in any direction on the nub, and whatever you control in the game will match that direction. While it may initially feel awkward, it soon becomes an ideal setup that truly works. This, combined with the aforementioned ZL and ZR buttons, could pave the way for a promising future of FPS games. Metroid Prime Hunters, for instance, was a personal DS favourite of mine, but the console's limited control scheme instigated a huge learning curve. With this new setup on the New 3DS, games like Hunters will be right at home. The New 3DS also has a feature called Super Stable 3D. 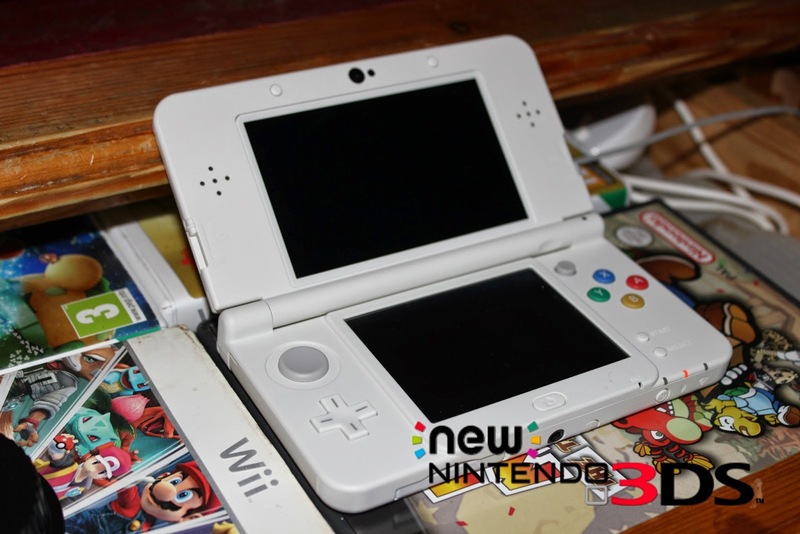 Many people expressed dissatisfaction at the original 3DS for having a very limited 'sweet spot' for the 3D effect. If your eyes moved one fraction out of this zone, the 3D would become naught but a blurred mess. Using the front facing camera at the top of the system, the New 3DS tracks the players face and manipulates the angle of the 3D automatically - making the sweet spot substantially larger and the 3D more accessible. It's not flawless, but for the most part, it's a fantastic upgrade to the visual presentation. In terms of the exterior shape, the New 3DS is pretty much the same as it's predecessors, but the regular model (not the XL) has a unique feature of customisable faceplates - the front and back plate can be removed and exchanged for all sorts of different designs Nintendo have on offer, which is a nice touch for those wanting to personalise their console. The regular New 3DS has custom faceplates of all sorts of colours and designs. The New 3DS is all but excellent, but there is one major flaw I have been eager to discuss. The use of a Micro SD card. Why is this such a problem? Refer back to the original 3DS. A little flap on the side of the console would house your SD memory card, which could be quickly removed at any time. The New 3DS has it's Micro SD card tucked away underneath the console's back plate - which means you need a screwdriver, and a Micro SD to SD adaptor if you plan to transfer any data via a computer. Not only this, but the back plate screws are so stubborn that you'll continue to worry that you're damaging them, which also makes equipping the custom faceplates all the more awkward. I don't know what made Nintendo think this was a good idea, but I sure feel insecure when having to unscrew anything on my consoles, and so this can be a slightly intimidating process for newcomers. It's also absurd that the console doesn't come with a charger; it uses the same ones as the 3DS and DSi, but Nintendo evidently didn't consider that not every buyer will own one of those. Their official adaptor price is £10, but thankfully you can find third party clones for as little as £2.50. The New Nintendo 3DS is a fantastic update to the already excellent line of 3DS consoles, and will surely be the definitive version from here onward. I despise the use of a Micro SD, but now that I've fitted my larger 16GB Micro SD and the custom back plate, I'll never have to go through that hassle again and so it's a one time moment of agony. Once sorted, it surely proved to be one my favourite handhelds to date. Maybe it's not worth the upgrade just yet for those content with their current 3DS, but for those who don't already own one, now is the time to change that.